Nocturnes (L. 91), sometimes Trois Nocturnes or Three Nocturnes, is an orchestral composition in three movements by the French composer Claude Debussy. It was completed on 15 December 1899. Nocturnes may be connected to two earlier works, neither of which was ever finished, and the scores to both of which are lost. In 1892 the composer wrote that he was nearly finished with Trois Scènes au Crépuscule ("Three Twilight Scenes"), an orchestral triptych after poems by Henri de Régnier. Debussy also worked on a violin concerto for Eugène Ysaÿe, which he called "a study in gray painting". He abandoned both pieces when close to finishing them. Without their manuscripts, there is no certainty that material from either of these works was reused in Nocturnes, but it remains a distinct possibility. "Nuages (clouds)" – First movement of Claude Debussy's "Nocturnes"
Performed by the Virtual Philharmonic Orchestra (Reinhold Behringer) with digital samples. Nuages ("Clouds") Modéré – Un peu animé – Tempo I – Plus lent – Encore plus lent. Fêtes ("Festivals") Animé et très rythmé – Un peu plus animé – Modéré (mais toujours très rythmé) – Tempo I – De plus en plus sonore et en serrant le mouvement – Même Mouvement. Sirènes ("Sirens") Modérément animé – Un peu plus lent – En animant, surtout dans l’expression – Revenir progressivement au Tempo I – En augmentant peu à peu – Tempo I – Plus lent et en retenant jusqu’à la fin. 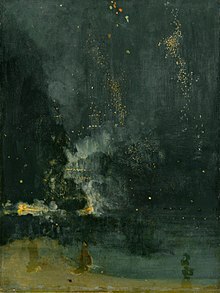 The three movements were inspired by a series of impressionist paintings, also entitled Nocturnes by James Abbott McNeill Whistler. The title Nocturnes is to be interpreted here in a general and, more particularly, in a decorative sense. Therefore, it is not meant to designate the usual form of the Nocturne, but rather all the various impressions and the special effects of light that the word suggests. 'Nuages' renders the immutable aspect of the sky and the slow, solemn motion of the clouds, fading away in grey tones lightly tinged with white. 'Fêtes' gives us the vibrating, dancing rhythm of the atmosphere with sudden flashes of light. There is also the episode of the procession (a dazzling fantastic vision), which passes through the festive scene and becomes merged in it. But the background remains resistantly the same: the festival with its blending of music and luminous dust participating in the cosmic rhythm. 'Sirènes' depicts the sea and its countless rhythms and presently, amongst the waves silvered by the moonlight, is heard the mysterious song of the Sirens as they laugh and pass on. Nuages and Fêtes were premiered by Camille Chevillard with the Lamoureux Orchestra on 9 December 1900 in Paris. The complete suite was first heard under the same forces on 27 October 1901. The initial performances met with a cool response from critics and the public, but today these are considered some of Debussy's most accessible and popular works, admired for their beauty. The music lasts for about 25 minutes. It is scored for three flutes (the third doubling piccolo), two oboes, cor anglais, two clarinets in B♭, three bassoons, four horns in F, three trumpets in F, three trombones, tuba, timpani, cymbals, snare drum, two harps, wordless female chorus (in Sirènes only), and strings. The complete work was transcribed for two pianos by Maurice Ravel. Fêtes was arranged for solo piano by the English pianist Leonard Borwick, and the arrangement has been recorded by Emil Gilels, among others. Fêtes has also been transcribed for large symphonic wind ensemble by Merlin Patterson and William Schaefer. ^ a b c "Nocturnes". La Phil. Retrieved 11 October 2012. ^ Brook, Donald. Five great French composers: Berlioz, César Franck, Saint-Saëns, Debussy, Ravel: Their Lives and Works. Ayer Publishing. p. 168. Wikimedia Commons has media related to Nocturnes (Debussy). This page was last edited on 29 November 2018, at 14:34 (UTC).